I am a wife and mother of 4 children. I enjoy the great outdoors, going camping and spending time with family. I was never a runner or walker up until March 2018, when I bought myself a new pair of shoes and started out by exploring the local trails – which at the time, I thought I was crazy. None of this would’ve been possible without the help of my sister Linda Holgate who is my inspiration. I now love getting out there and having a go, even though at times I don’t like how long it takes me. 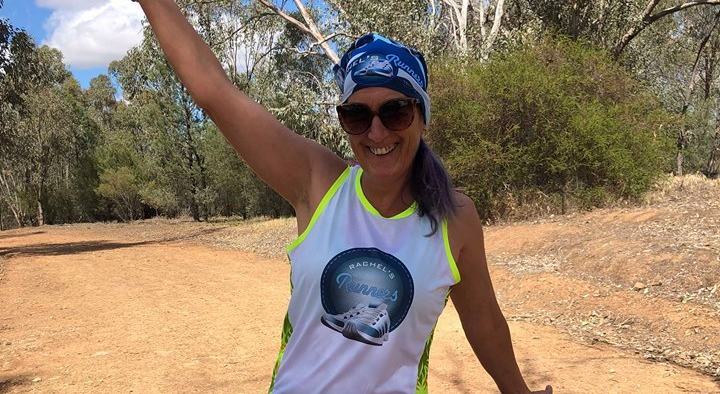 With no running background, I entered my first Half Marathon in Wagga in August of last year along with my sister, my friend Clare, my mum and a few others. It took me 3 hours and 44 minutes to complete and I was over the moon with my time! I’ve now decided to enter another 2 half marathons this year, maybe even 3, but we will see. Running is like mediation. It takes all my worries away and leaves me feeling in touch with myself, strong and believing I can do almost anything. My ASICS Gel Nimbus running shoes, my 2XU gear, and now my Rachel’s Runners team singlet and buff! At first, my biggest challenge was when I entered the half marathon in Wagga and I just wanted to get to the finish. Now it’s learning to run more instead of walking, while keeping my pace. A bladder control tool of some description! LOL! Believe in yourself and you will succeed!